Tomorrow is Election Day here in the United States and this morning I wanted to look at a piece I’ve had in mind on doing from City Lab. I held off because it looks at the election and what better time to do it than right before the election. Specifically, the article looks at the density of the different congressional districts across the United States. Whilst education level appears to be the most predictive attribute of today’s political climate—broadly speaking those with higher levels of formal education support the Democrats and those with lower or without tend to support President Trump—the growing urban–rural divide also works. But what about the in-between? The suburbs? The exurbs? And how do we then classify the congressional districts that include those lands. 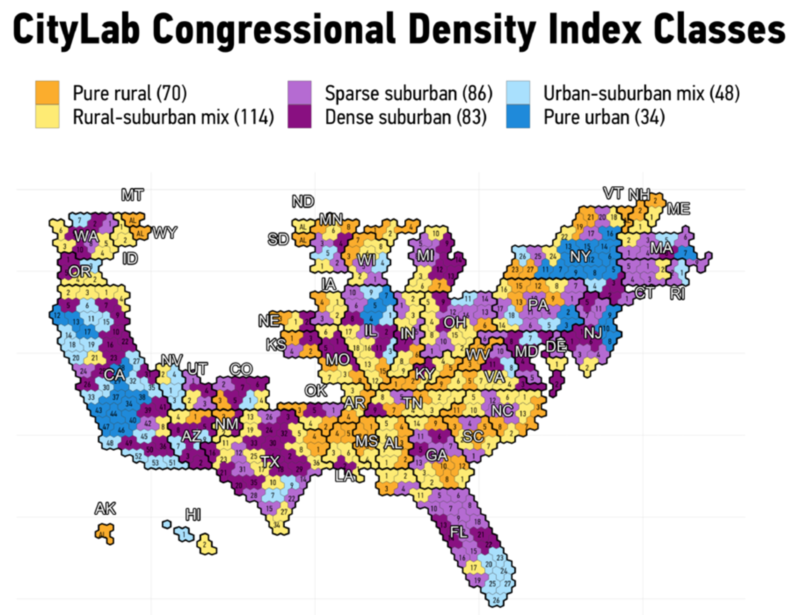 For that purpose City Lab created its City Lab Congressional Density Index. Very simplistically it scores districts based on their mixture of low- to medium- to high-density neighbourhoods. But visually, which is where this blog is concerned, we get maps with six bins from pure urban to pure rural and all the mixtures in-between. 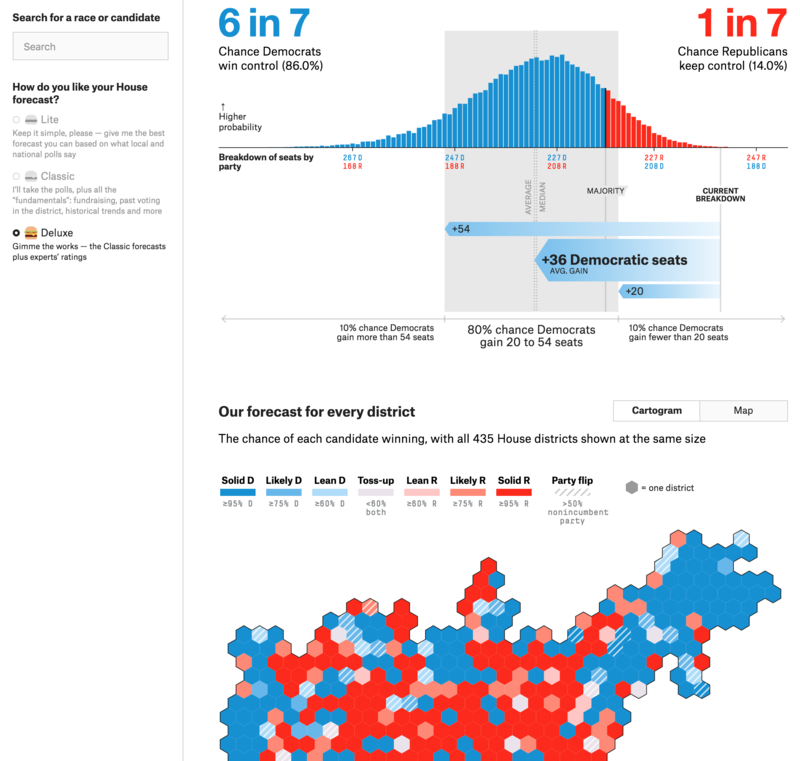 This cartogram will show you. Now, there are a couple of things I probably would have done differently in terms of the visualisation. But the more I look at this, one of those things would not be to design the hexagons to all fit together nicely. Instead, you get this giant gap right where the plains states begin west of the Mississippi River stretching through the Rockies over to California. If you think about it, however, that is a fairly accurate description of the population distribution of the United States. With a few exceptions, e.g. Denver, there are not many people living in that space. Four geographically enormous states—North Dakota, South Dakota, Montana, and Wyoming—have only one congressional district. Idaho has two. Nebraska three. And then Iowa and Kansas four. So why shouldn’t a map of the United States display the plains and Rocky Mountain interior as a giant people hole? Like I said, initially I took umbrage at that design decision, but the more I thought about it, the more it made sense. But there are a few others with which I quibble. The labelling here is a big one. First, we have the district labels. They are small, because they have to be to fit within the five hexagons that define the districts’ shapes. But every label is black. Unfortunately, that makes it difficult to read the labels on the darker colours, most notably the dark purple. I probably would have switched out the black labels in those instances for white ones. But then the state labels are white with black outlines, which makes it difficult to read on either dark or light backgrounds. The designer made the right decision in making the labels larger than the districts, but they need to be legible. For example, the labels of Alaska and Hawaii need not be white with black outlines. They could just be set in black type to be legible. Conversely, Florida’s, sitting atop darker purple districts, could be made white. The piece makes use of more standard geographic map divided into congressional districts—the type you will see a lot tomorrow night. And it makes use of bar charts to describe the demographics of the various density types. I like the decision there to use a new colour to fill in the bars. They use a dark green because it can cut across each of the six types. Credit for the piece goes to David H. Montgomery. Wow do we have a lot to talk about this week. Probably bleeding into next week to be honest. But, last night was the special election for the Georgia 6th. For those of you not following politics, the congressman representing it was Tom Price; he is now the Secretary of Health and Human Services. 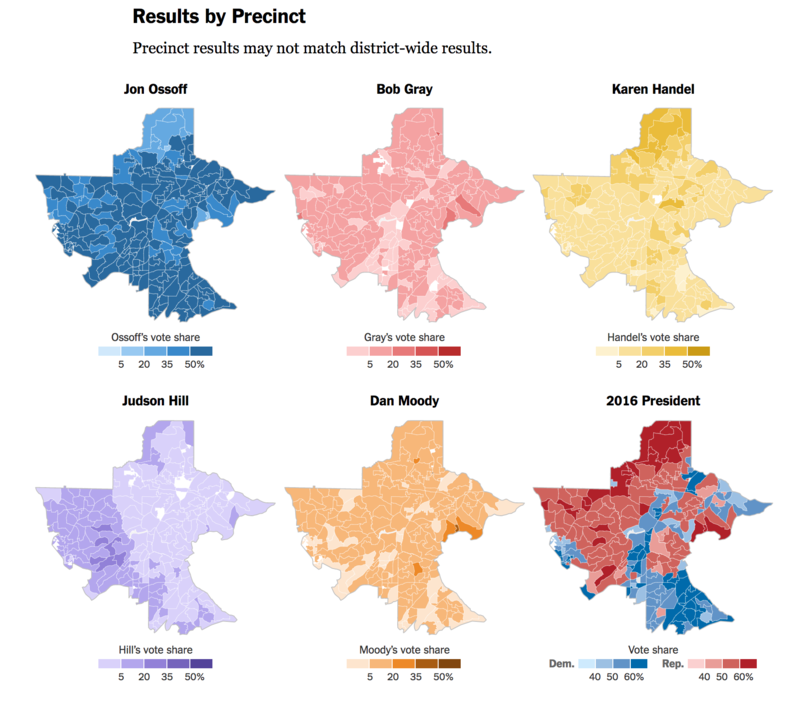 Consequently, Georgia needed to elect a fill-in for the Atlanta-suburbs district. That election was between 18 candidates last night. The race could have been won outright, but it would have required a vote total over 50%. That did not happen—and realistically with 18 people running was not likely. But, Democrats hoped they could get their candidate in at 50+%. This screenshot is from a nice piece by the New York Times. 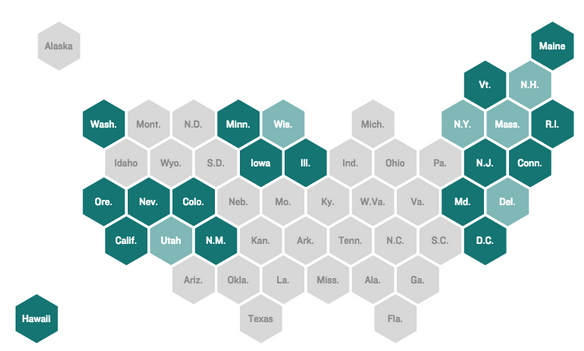 As you all know by now, I am not a huge fan of choropleth maps. They distort geographic area and population. But, I like the arrangement of these small multiples. It does a nice job of comparing the results for the five major candidates. I particularly like the addition of the 2016 presidential election result. With the cratering poll approvals of Donald Trump, could some of the paler red precincts flip in June? The above screenshot comes from BuzzFeed, whose coverage I followed via live streaming last night. They used a cartogrammic approach, assuming that cartogrammic is actually a word. The colours could use a bit more sophistication—the best example being the Democratic–Republican margin map where the blues are darker than the reds and have a hopefully unintended greater visual weight. Sorry about last week, everyone. I had some trouble with the database powering the blog here. Great week for things to go down, right? Well, either way, we’re back and it’s not like the news is stopping. This week? Brexit’s back, baby. I’m never using the word “baby” again on this blog. I have been saving this piece until the announcement of Article 50 by the UK government. I know the British and Europeans among my audience likely know what that means, but for the rest of you, Article 50 is the formal mechanism by which the United Kingdom starts the two-year process to leave the European Union. Think of it like signing the divorce papers, except that the divorce isn’t unofficial for two years until after that date. The interim period is figuring out who gets which automobile, the dinnerware, and that ratty-old sofa in the basement. Except that instead of between two people, this divorce is more like a divorce between polygamists with multiples husbands and wives. So yeah, not really like a divorce at all. This piece from the Guardian attempts to explain what the various parties want from the United Kingdom and from the eventual settlement between the UK and the EU. 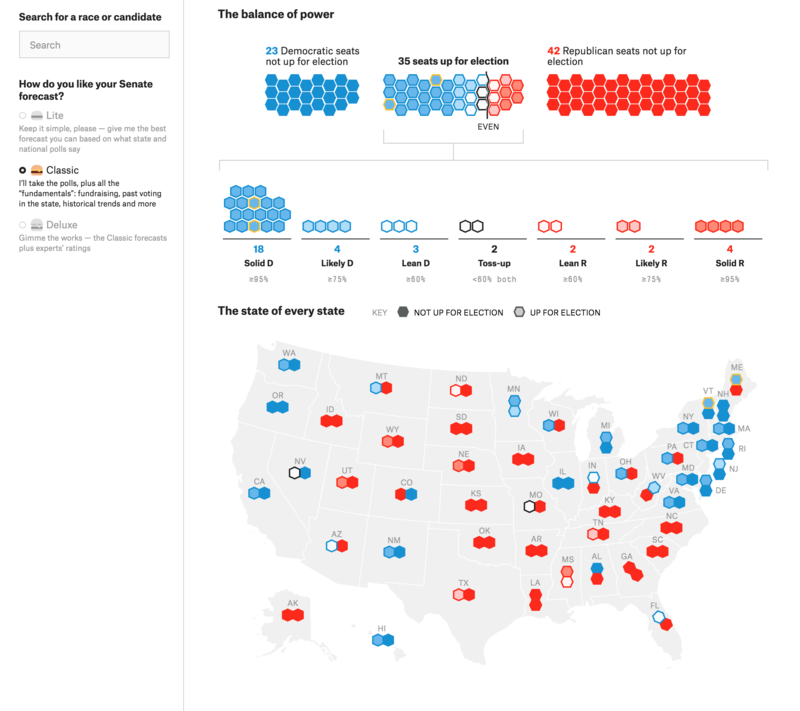 It leads off with a nice graphic about the importance of a few key issues in a cartogram. And then several voting blocs run down the remainder of the page with their key issues. 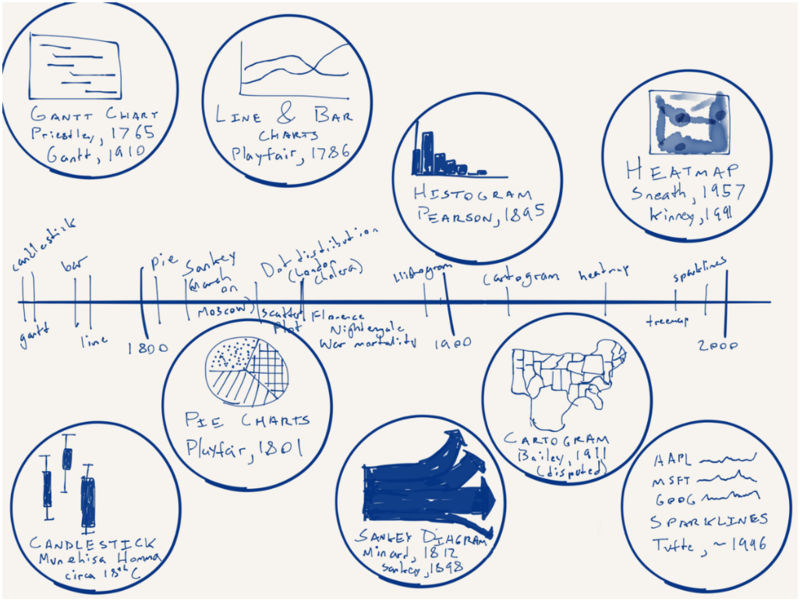 I really like this piece as the small multiples for each section refer back to the opening graphic. But then on a narrow window, e.g. your mobile phone, the small multiples drop off, because really, the location of the few countries mentioned on a cartogram is not terribly important to that part of the analysis. It shows some great understanding of content prioritisation within an article. In a super ideal world, the opener graphic would be interactive so the user could tap the various squares and see the priorities immediately. But overall, a very solid piece from the Guardian. Author Brendan BarryPosted on 27 March 17 27 March 17 Categories InfographicTags Brexit, cartogram, European Union, Guardian, infographic, information design, maps, politics, small multiples, United KingdomLeave a comment on What Does Europe Want from Brexit? One of the big news stories yesterday centred on the Trump administration’s budget outline that would expand US defence spending by 9%, or $54 billion. That is quite a lot of money. More worrying, however, was the draft’s directive that it be accompanied by equal spending cuts in neither security nor entitlement programmes like Social Security and Medicare. Nor, obviously, the trillions allocated for mandatory spending, e.g. debt repayment. White House officials—worth noting of the Trump-despised anonymous type that I suppose that only matters if reporting unflattering news—declined to get into specifics, but pointed out foreign aid as an area likely to receive massive cuts. 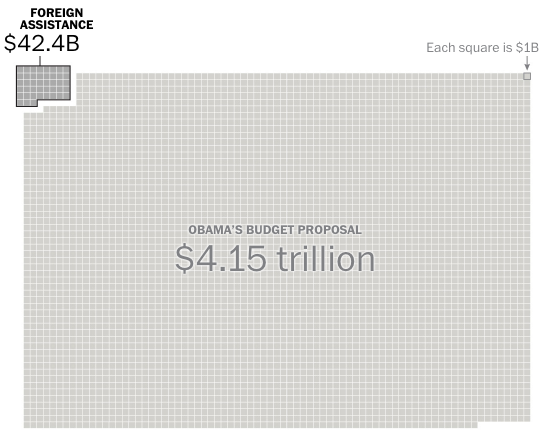 Problem is, foreign aid is one of the smallest segments of the federal budget. How small? Well, let’s segue into today’s post—see how smooth that was—from the Washington Post. The article dates from October, but was just brought to my attention to one of my mates. 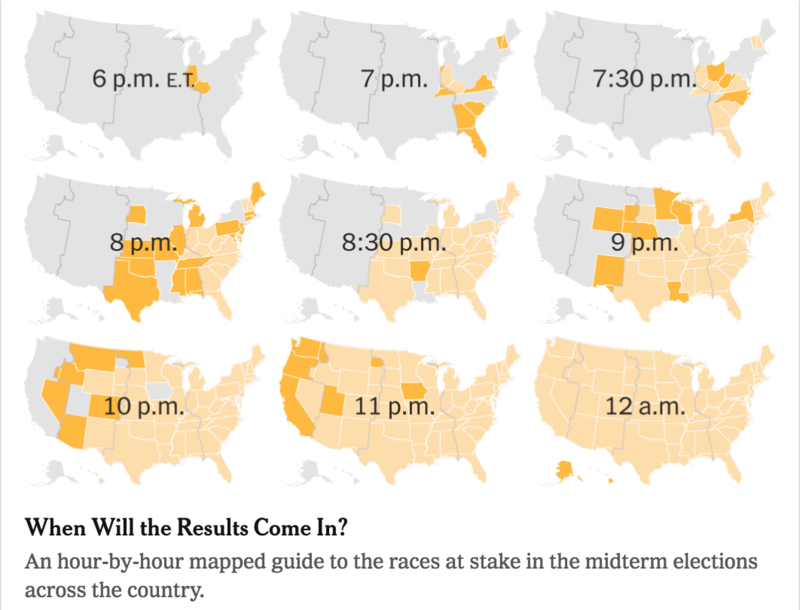 Beyond this graphic that leads the piece, the Post presents numerous cartograms and other graphics that detail spending patterns. Hint, there is a pattern. But those patterns could also make it difficult to slash said spending. The reason foreign aid spending is important is that it ties nicely into that concept of soft power. No surprise that over 120 retired generals and admirals told Congress that spending on diplomacy and foreign aid is “critical to keeping America safe”. But for now this remains a budget outline sent to federal agencies to review. The actual budget fight is yet to come. So I’m sure this won’t be the last time we look at this topic here on Coffeespoons. Credit for the piece goes to Max Bearak and Lazaro Gamio. Well the Democratic DC primaries were last Tuesday and Hillary Clinton won. So now we start looking ahead towards the July conventions and then the November elections. Consequently, if a day is an eternity in politics we have many lifespans to witness before November. But that does not mean we cannot start playing around with electoral college scenarios. 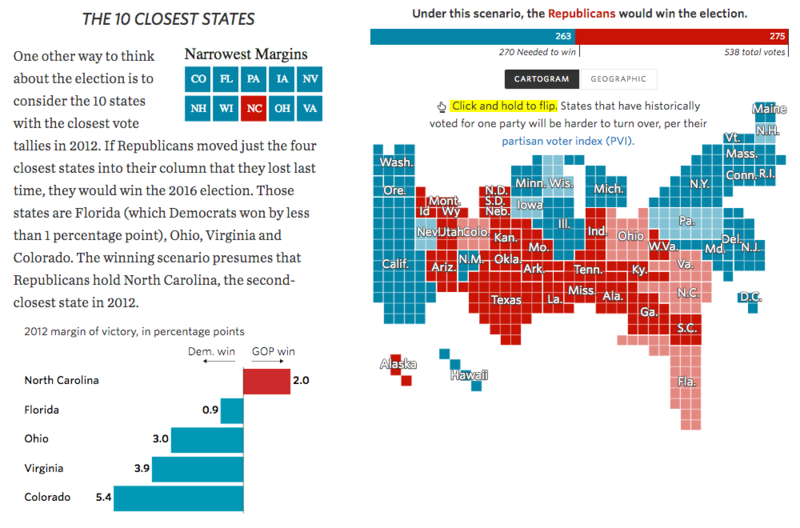 The Wall Street Journal has a nice scenario prediction page that leads with the 2012 results map, in both traditional map and cartogram form. You can play god and flip the various states to either red or blue. But from the interaction side the designers did something really interesting. Flipping a state requires you to click and hold the state. But the speed with which it then flips is not equal for all states. Instead, the length of hold time depends upon the state’s likelihood to be a flippable state, based on the state’s partisan voter index. 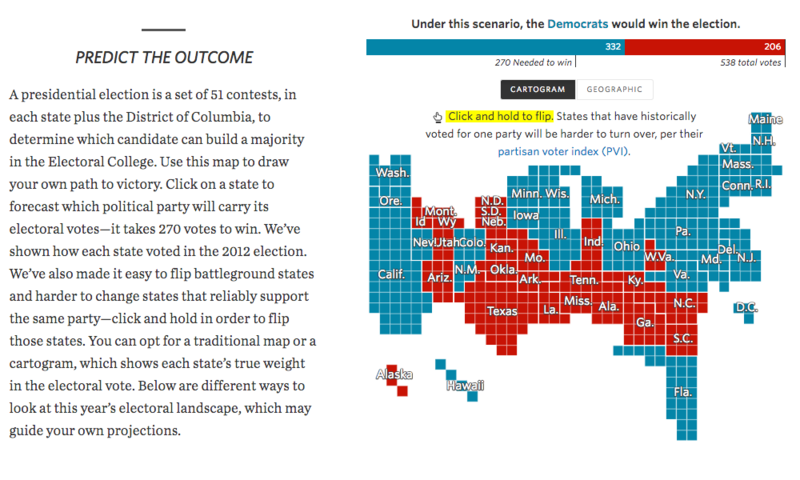 For example, if you try and flip Kansas, you will have to wait awhile to see the state turn blue. But try and flip North Carolina and the flip is near instantaneous. 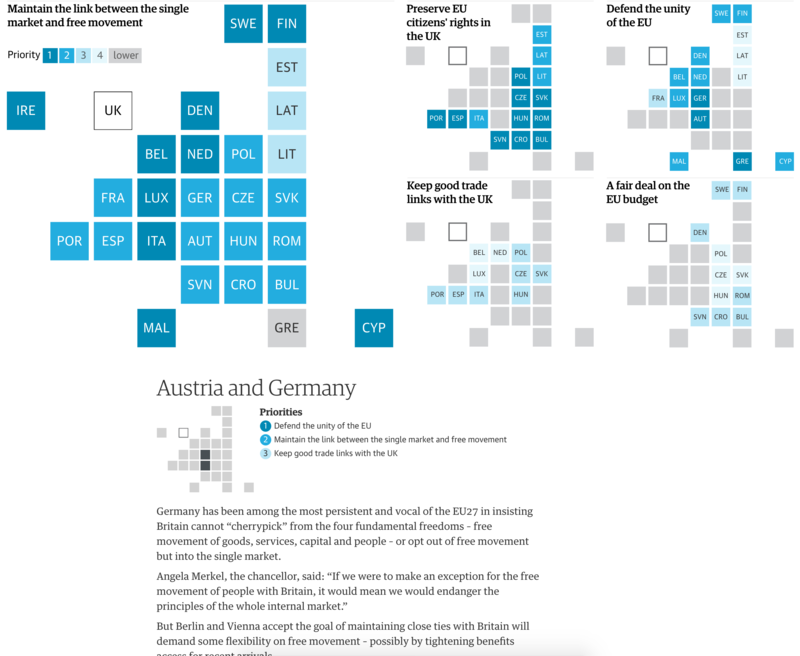 While the geographic component remains on the right, the left-hand column features either text, or as in this other screenshot, smaller charts that illustrate the points more specifically. 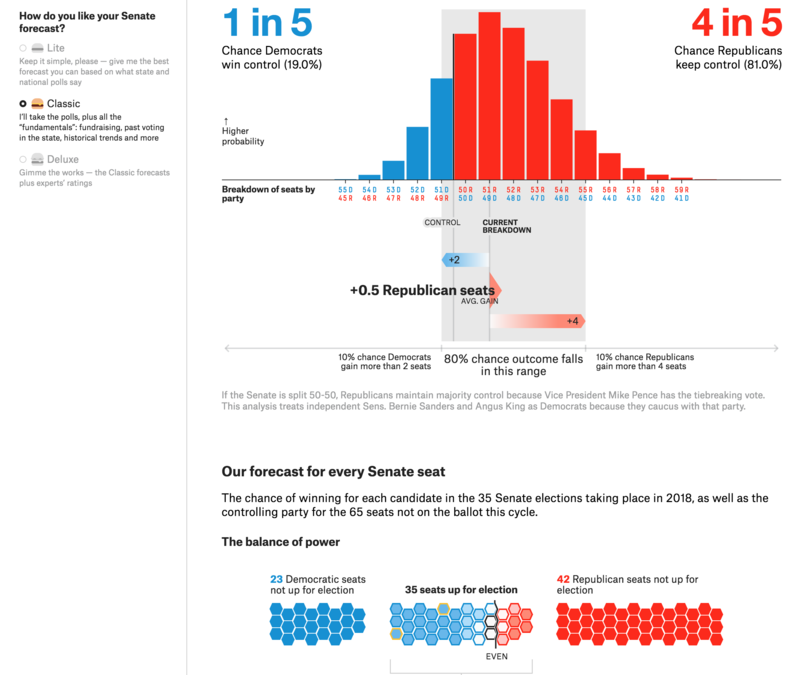 Taken all together, the piece does a really nice job of presenting users with a tool to make predictions of their own. The different sections with concepts and analysis guide the user to see what scenarios fall within the realm of reason. But, what takes the cake is that flipping interaction. Using a delay to represent the likelihood of a flip is brilliant. Credit for the piece goes to Aaron Zitner, Randy Yeip, Julia Wolfe, Chris Canipe, Jessia Ma, and Renée Rigdon. Credit for the piece goes to Danny DeBelius. Let’s start this week off with cartograms. Sometimes I like the idea, sometimes not so much. 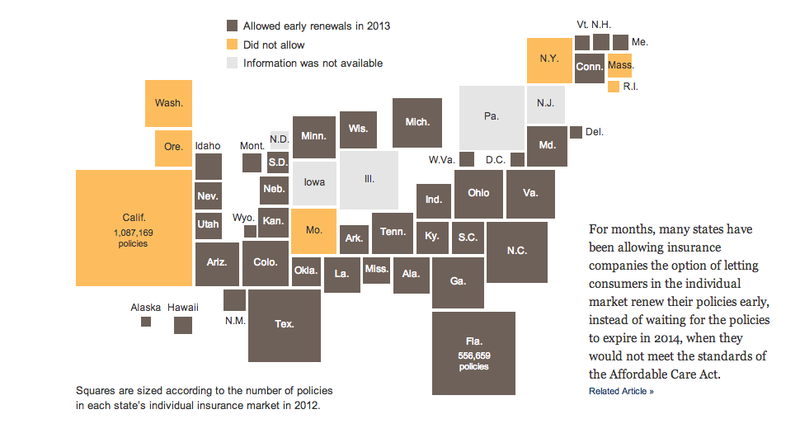 Here is a case where I really do not care for the New York Times’ visualisation of the data. 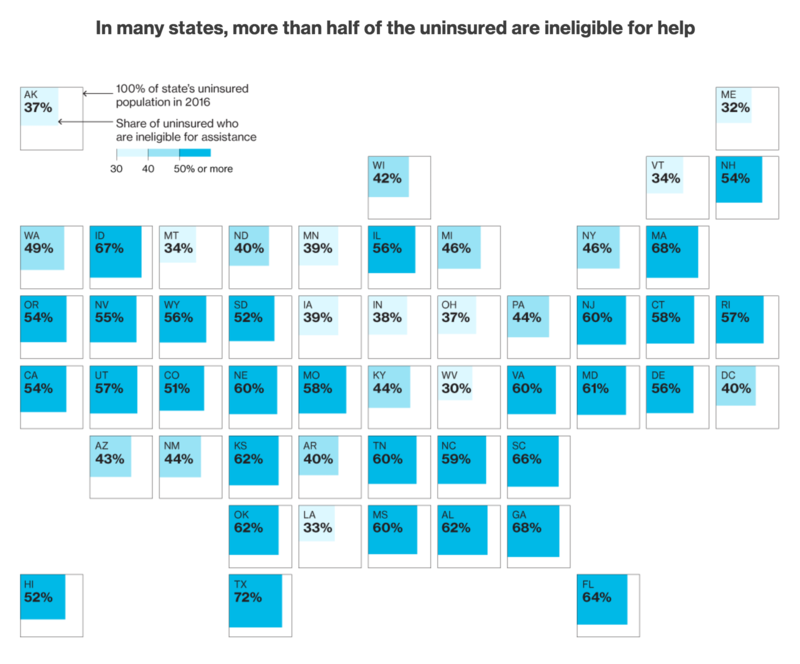 Probably because the two cartograms, a before and after of health policy renewals, do not really allow for a great side-by-side comparison. I imagine there is probably a way of condensing all of that information into a single chart or graphic component. Credit for the piece goes to Keith Collins, Josh Katz, Katie Thomas, Archie Tse, and Karen Yourish.